The previous post, Humanity is Lost, was my attempt to reblog a post of a bloger I follow. If you click on the title, you should be able to open and read the post. 201 kilometers of pedaling in four days. Certainly nothing to brag about. But, we are no longer young and it’s been a few years since we have done any serious cycling. We were also biking with our panniers – worth a few extra Brownie points. The cycling was mainly on flat terrain following bike routes along the Saar and Moselle rivers in Germany: pleasant, easy, scenic. We made it — back to the car in Merzig where it all began. The bike excursion was a highlight of our spring trip back to Germany where we lived for many, many years before moving to France. We love going back, seeing friends, drinking the world’s best beer, enjoying our favorite German foods — and discovering more of Germany. 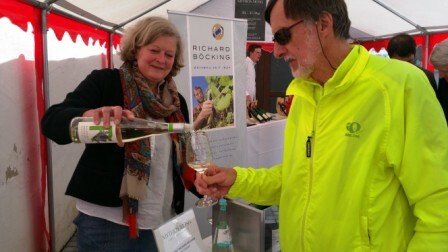 Wines in Baden, hikes in the Black Forest, sights in Saarbrücken– add all that to bicycling and it makes for a wunderschön (wonderful) trip. It wouldn’t be Germany without a bit of rain. 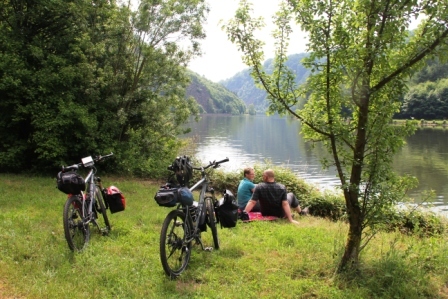 Google led me to a blog post,”A Bicycle Ride along the Saar and Moselle Rivers.” Perfect for us, I decided. We cut short the part on the Saar, pedaling only from the town of Merzig to Konz where we picked up the Moselle Bike Route and followed it to Bullay. A break from the bikes to enjoy the scenery. The Saar section was serene, sublime. Few people. Few major towns. Trees, the river and vineyards. We stopped to chat with a couple from northern Germany who were taking a break from the bikes and lounging in the grass. “We’ve never be to Saarland. It’s beautiful and not so touristic,” she said. Along the Moselle we pedaled past lots more vineyards, through more towns, and encountered more cyclists. 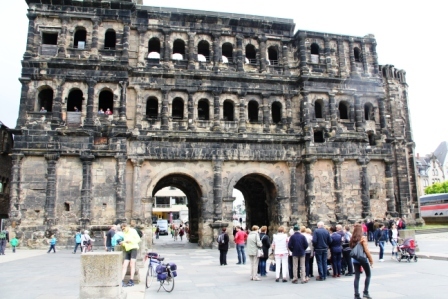 We felt we needed to see the major sight in Trier, the Porta Nigra, but biking through the congested city was not pleasant. However, tasting wine in the town of Graach where Mythos Mosel, a Riesling wine tasting event was underway, was very pleasant. 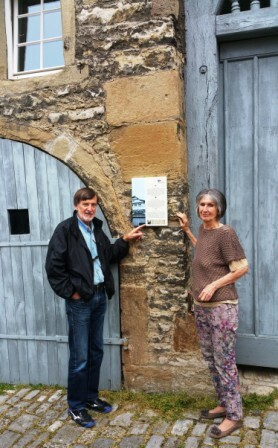 BB/VR gets a taste of Moselle wine. 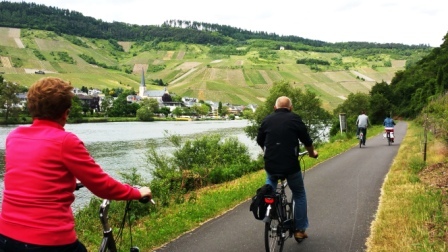 Be it in Germany, Austria, Switzerland, France—wherever, biking along marked cycle routes is usually a joy. For the most part you encounter few cars. Unfortunately this was not entirely the case for us this ride. As navigator, I am to blame. Instead of carefully consulting the bikeline guidebook when leaving one town, I chose the wrong side of the river for our ride. We were on a bike path, but not the right one. The trail deteriorated, leading us onto a muddy track bordered by thick vegetation. No way to ride this, so we pushed the bikes through the swamp. The worst was not over. We followed the path out of the mud and up a hill, only to be faced with a busy major and narrow highway. Cars sped by much too close for comfort. Add to that: rain. 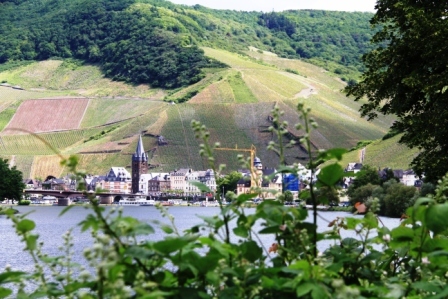 Postcard villages surrounded by vineyards abound on the Moselle. I don’t frighten easily, but this was very scary. I feared we may have missed the one bridge that would lead us to the other side and the correct bike route. I used all my energy to pedal as fast as I could, hoping we would find the bridge before being crushed by a car. We survived and were relieved to arrive in Trittenheim and find the welcoming home of Marlene Bollig, a guest house where we had booked a room. I told her about our adventure. “No one rides on that side of the river,” she said. “Well now you have an adventure to write about. “ One adventure I could have done without. 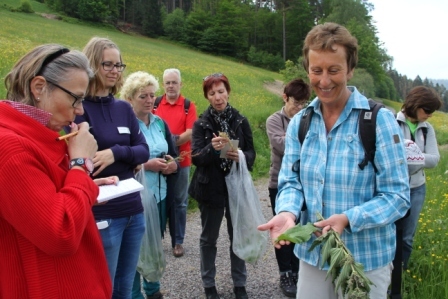 Hikers learn about wild herbs. Our adventure in the Black Forest was problem free, fun and interesting. We joined a guided group hike, Wild herbs: Multitalent. “My passion is to delve into nature and gather herbs. I learned from my grandmother,” guide Heidi announced. The trek was easy with numerous stops where she plucked a plant or flower, then explained its use in the kitchen and its nutritional, as well as medicinal, value. 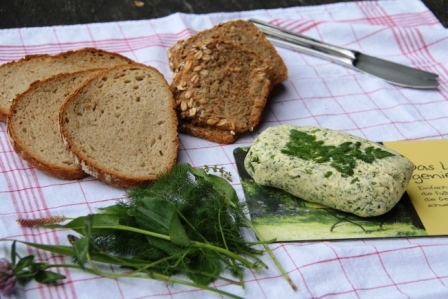 Butter mixed with wild herbs– delicious on bread. The forests and fields are indeed rich in edible treasure, but don’t try to eat all. “No, you can’t eat that,” she announced as one of the group pointed to some lovely yellow flowers. “Not even cows will eat that. The stomach won’t tolerate it.” She treated us to a wild herb snack which our stomachs tolerated with pleasure, bread smeared with tasty herb butter made from plants of the forest. We followed guide Rolf Wein on another hike, uphill to the Genuss Platz (Pleasure Place), a scenic spot with benches he and friends had made long ago. His treat, wild plum schnapps which he had made. Rolf Wein led us to his favorite spot in the Black Forest. Baiersbronn is a wunderschön town, especially for foodies. 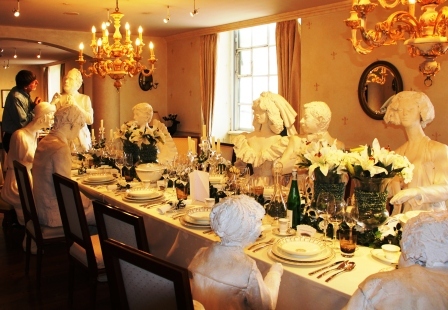 Its restaurants have a total of eight Michelin stars, quite amazing for a town of 14,500. I had the privilege of interviewing three-star chef Claus-Peter Lumpp at the Hotel Bareiss, one of the town’s five-star hotels. 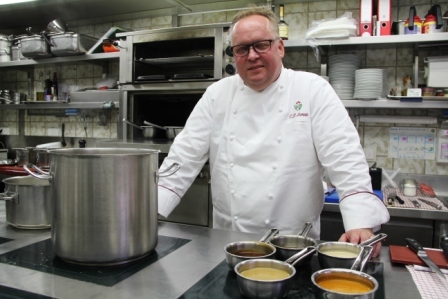 3* Chef Claus-Peter Lumpp in his kitchen. 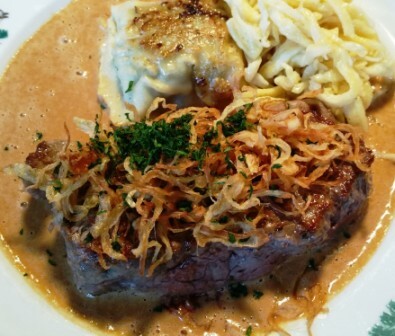 Zwiebel Rostbraten with Spaetzle — very wunderschoen. Dining at the three star restaurant was beyond our budget, but we enjoyed the tastes of Germany at the hotel’s gemütlich Dorfstuben where I indulged in my all-time German favorite: Zwiebel Rostbraten (Onion Beef). During our travels we savored other German favorites, such as Sauerbraten, Bratwurst, Sauerkraut and red cabbage. 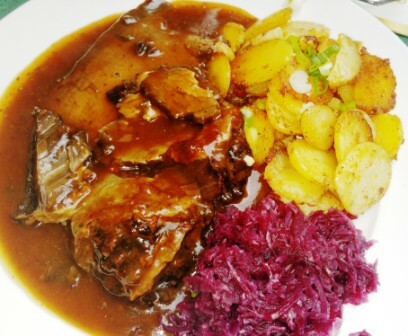 Sauerbraten, Rotkohl and Bratkartoffeln (Sauerbraten with red cabbage and fried potatoes). Makes me hungry. And, German wines. 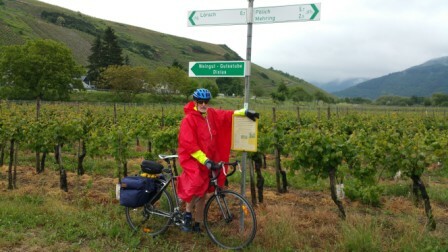 Although the Moselle is a noted German wine region, except for our one tasting along the bike route, we had no time for serious wine discovery there. We made up for it in Baden, part of the state of Baden-Wurttemberg in southwestern Germany. The Black Forest is part of this state. The Baden section borders both France and Switzerland and is Germany’s warmest and sunniest region. Baden produces more red than white wine, which is rare for Germany, a country known best for its white wines, especially Riesling. Bicycle Bob (BB) is known more as VR (Vino Roberto) these days since his passion for wine now exceeds his love of his bicycle. We not only tasted our way through many Baden wineries, VR bought a supply, too. Our friend Heinz gave us a delicious souvenir to take home – six bottles of his favorite Baden white, Oberrotweiler Grauer Burgunder. Heinz and Heti live in Sindelfinen adjacent to Stuttgart, not far from where we used to live. We stayed at their beautiful home and had the chance to reunite with many of our friends from those days at a fun evening, a pot luck dinner they arranged. Danke Heti and Heinz. Alles wunderschön. We’d never been to Saarbruecken. It’s worth a visit. Ludwig’s Church is a Baroque masterpiece. 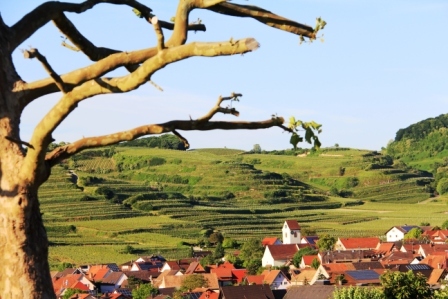 Villeroy & Boch makes its home in Mettlach in the Saarland. A visit to its ceramics museum — and outlet store — is enticing. Visit to my angel cat savior Sigrid Ruckaberle and house where “the maternal great grandfather of the fifth generation of Barack Obama” was born in 1729. Her hometown. Besigheim, is proud. 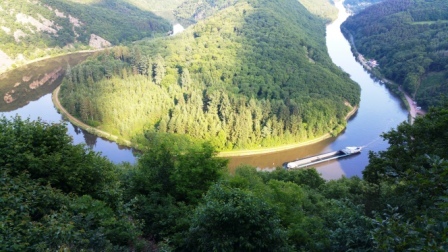 Saarschleife, a bend in the Saar River near Mettlach. Thank you Emmy. 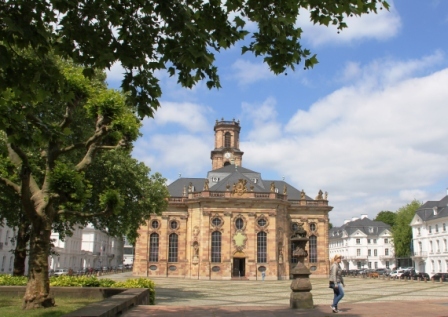 I am happy to know that my blog brought back pleasant memories of Trier and delicious Riesling. Both are tops. 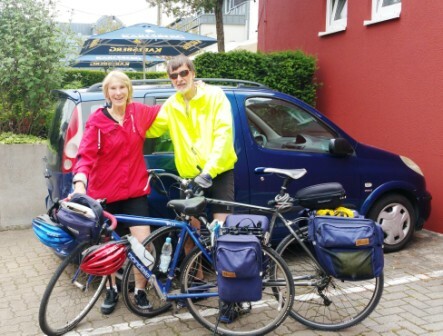 I so enjoyed reading this blog posting and reminiscing about the enjoyable bicycle rides and other great experiences we had in Deutschland. 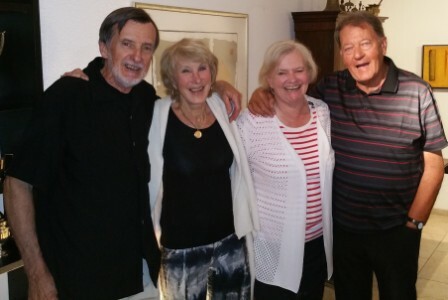 It was great to see the photo of you, Bob, Heti, and Heinz. None of you have changed. You all look great! Take care! I enjoy reading your articles from time to time! It’s wonderful to hear from you, Debbie, but hard to believe you have a son in middle school! Yes, time flies. We love France, but it is always a treat to go back to Deutschland. Like you, we had great times there. I hope you get back to Germany one of these days. Swing south and come and see us in France. We’d be happy to welcome you. Greetings to Dan and thanks for the lovely comment. A lovely read-and the food made my mouth water. 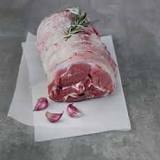 That includes the butter & wild herbs. Doubt if I’ll ever take this trip, but it’s fun to be an armchair biker! A highlight of our trips back to Germany is the food. Hearty and tasty. I am glad you enjoyed reading about our bike escapade. I hope it won’t be the last. Now that’s a compliment!. You’ve made my day. Thank you so much, Sue. See Sue’s links above for her amazing beads. She makes gorgeous jewelry. Hi Leah I really enjoyed this article and all your others too! You are better than Rick Steves!